If you’ve always dreamed of seeing Japan’s sakura in full bloom come spring, you’ll now get to – because fresh cherry blossoms will be flown in as part of Japan Food Town’s Sakura Fair from March 31 to April 16. There’ll be plenty to feast on, too, with popular spring ingredients – think bamboo shoots, sakura shrimps and nanohana (rapeseed blossoms) – weaved into ‘sakura-inspired’ menus across all 16 restaurants, in collaboration with the Japan Association of Overseas Promotion for Food & Restaurants (JOAF) and Cool Japan Fund. To make things easier, we’ve curated a round-up of the best appetisers, mains, desserts and drinks for your picking. After a taste of what the Sakura Fair has to offer? Make a stop at Tsukiji Sushi Takewaka for its wild plant tempura ($15) and baked baby bamboo ($20). Better yet, try the sakura ebi kakiage ($18) that’s deep-fried with a variety of chopped vegetables. Or get your taste buds acquainted with the delicate rapeseed blossoms in Japanese mustard broth ($8.80) at Inanwa Yosuke. Yomoda Soba’s got your buckwheat noodle cravings covered, and you won’t go wrong with its spring-themed wakatake soba and hijiki no takikomi rice set ($27.50), which comes with a crisp chrysanthemum tempura. Then there’s Nabe Seizan’s weekend-only lunch menu: for $30, you’ll be treated to sakura prawn dashi, served with takikomi rice. Round off your meal – or maybe skip the mains – and make for Anzu, where you’ll get to tuck into almond tofu with sakura flower sauce for $8. The sakura parfait (from $10) at Rang Mang Shokudo works up just as much a textural treat as a refreshing dessert, thanks to the red bean and mochi served with it. 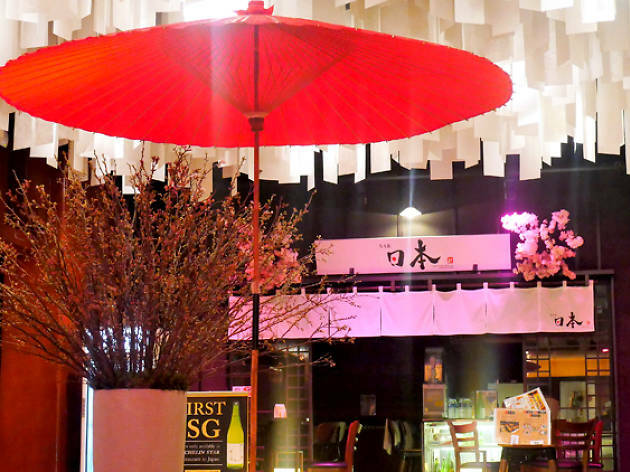 Don’t miss Taki’s matcha and sakura yatsuhashi ($15), either. The cinnamon- and glutinous rice flour-based sweet is commonly found in confectionery shops in Kyoto, Japan. If you’re leaning more towards the tipple, though, get your fill at Bar Nippon – its sakura-flavoured frozen beer (from $12) will quench your thirst. You’ll find a sweeter option in the sakura highball ($12), built with Fuji Sanroku whisky, sakura liqueur and soda. 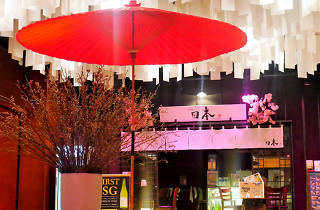 The Sakura Fair @ Japan Food Town runs from Mar 31-Apr 16 at Wisma Atria Shopping Centre.